Children are inherently curious, imaginative, and creative. They yearn to explore their environment and wonder in awe at the mysteries of the natural world. Every child routinely envisions fantastical lands, which push the boundaries of the physical rules that govern our reality. Given time, space, and the most basic supplies, a child can conjure up a new game or construct an intricate world to call their own for the afternoon. All of the core skills needed for children to grow into professionals seeking scientific breakthroughs and cutting-edge engineering feats are innately present from their earliest stages of development. What happens between early childhood and the completion of school that leads so many students astray from the inquisitive, inventive, and innovative mindsets of their youth? How then can families and schools partner to cultivate an attitude of discovery and design? A welcome trend at many forward-thinking schools is to construct multi-use spaces, equipped with a myriad of creative and technical tools and materials. Opportunities for open-ended exploration are then woven into busy and structured schedules. Setting aside an afternoon, or even an hour, for tinkering with a set of k’Nex or inventive play with a littleBits kit can reawaken a spirit of playful ingenuity that can lead to a lifetime of study. At St. Andrew’s Episcopal School, the annual STEM Expo showcases the surprising cleverness of young minds. Critical thinking, problem solving, and analytical skills are put to the test as students’ collaborative work is critiqued by STEM professionals in our community. Fifth Grade students will share their use of design thinking to build empathy with 3 year olds as they design and construct age appropriate toys. Sixth Grade students describe their many failures as they seek success with their Rube Goldberg Machines. Seventh Grade students defend their design choices for re-imagined campus spaces digitally created using Sketchup. Students are given the freedom to take their projects in new directions and learn new ways without being taught, but rather by exploring their own creations and initiating an adventure of their own. For more information, call Lisa Witter, Director of Advancement, Enrollment & Financial Aid at (504) 866-6553. Chris Sedgwick is a science educator who has worked in the field of education since 2003. He earned a a B.A. in Environmental Studies from Emory University and a M.A.Ed in Curriculum and Instruction from the University of Washington. 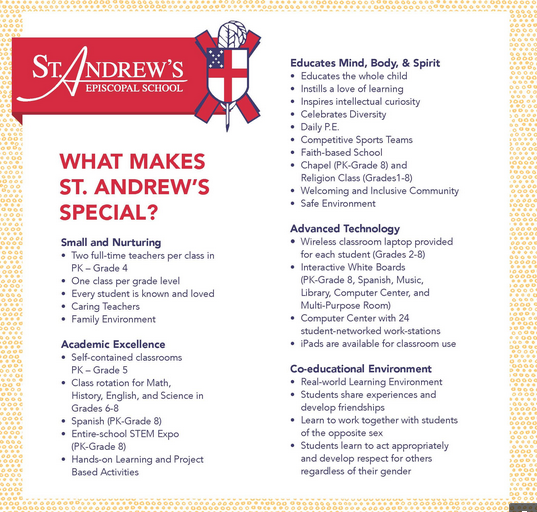 He is the Dean of Student Life and Science Department Chair at St. Andrew’s Episcopal School. He and his wife, Michelle, have a daughter, Emory.